While the televised Doctor Who has long since shied away from the true historical genre, opting to include otherworldly beings or technological anachronisms in its jaunts to the past, Big Finish has generously kept the genre alive and well, proving time and time again that solid drama in any medium has the potential to be just as engaging as the flashiest of special effects. 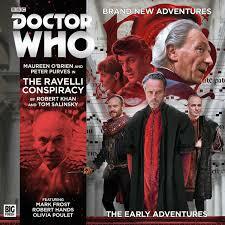 The Early Adventures gives Big Finish the opportunity to more thoroughly explore Earth’s past with the original TARIDS teams that most frequently did so, and ‘The Ravelli Conspiracy’ bravely follows the First Doctor, Vicki, and Steven into the ever-increasing conspiracies of 1514 Florence with astounding results. Dennis Spooner left his role of script editor in early 1965 and is responsible for fully introducing Steven in ‘The Time Meddler,’ his final solo script. However, despite the chronological placement of ‘The Ravelli Conspiracy,’ writers Robert Khan and Tom Salinsky have managed to channel the distinctive voice of Spooner in this comedic drama that quickly sees Steven and Vicki captured and Niccolo Machiavelli trying to re-establish himself in the House of Medici, the script emphasizing Machiavelli’s lofty reputation while not discounting the fact that his theories about gaining and wielding power are much more successful than his actual actions. Without delving too deeply into the incredible political complexities of the time, ‘The Ravelli Conspiracy’ still manages to flesh out the intrigue encapsulating religion, family, and status enough to create a satisfyingly deep and entertaining world that the sound design helps bring to life wonderfully as schemes and plots continue to mount. Mark Frost is stunning as his Machiavelli attempts to regain his status with his seminal manuscript at hand, and both Robert Hands as Pope Leo X and Jamie Ballard as Guiliano de Medici do very well with the difficult struggles of balancing family and power without ever devolving into caricatures as threats and betrayals come from literally all sides. Splitting the leads up for an extended period has been a trusted technique in Doctor Who since the beginning, but ‘The Ravelli Conspiracy’ fortunately avoids the all-too-common result of having one or more of the characters relegated to secondary or inconsequential status. Instead, the disparate but connected experiences of the Doctor, Vicki, and Steven each prove vital to allowing this incredibly layered plot to work so successfully while also giving standout moments of characterization to each. As always, Peter Purves and Maureen O’Brien are on absolutely top form as they recapture the youthful essences of Steven and Vicki, respectively, and Purves again does truly astounding work in bringing Hartnell’s Doctor back to life. The list of historical figures the Doctor hasn’t met in some form is continually shrinking, but ‘The Ravelli Conspiracy’ once more proves that the pure historical format still has incredible potential to tell satisfying and poignant drama in its own right. Machiavelli is such a natural figure to compare and contrast to the enigmatic Doctor that it’s rather surprising the two haven’t crossed paths before, but the wait was well worth it with this atmospheric and thrilling tale of intrigue and machinations delivering on every front and proving to be a prime example of everything The Early Adventures sets out to achieve.